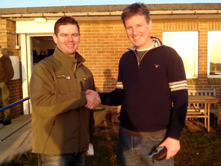 Seven club members went down to the Farmoor Xmas match, which was won by Harry Fox with 8 fish for 15-7-0, with Tony second with 6 for 12-10-0. Mike Heritage got the biggest fish, a 3-13-0 rainbow. It sounds as though they had a harder day than our Fur & Feather, with 33 competitors catching 46 fish, for a rod average of 1.4. 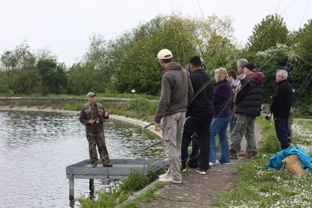 Our Casting Clinic with instructor Mike Heritage did not see a huge turn-out, but this did mean that anyone who was keen enough to make the effort was guaranteed a couple of hours of top-class one-to-one instruction, which was sure to get them off to a great start. In the afternoon we turned theory into practice, getting a few fish on Booby from an increasingly more windy No4, while Phil Smithson had a couple of nice fish from the East Warwick. Our grayling trip on the R.Test at Wherwell enjoyed great conditions, with light winds and an overcast sky, which made it easier to creep on fish in these narrow carriers. Small Olive Shrimps took fish to over 40cms in the morning, with Richard Mosek getting another couple of lunkers after our lunch, which consisted of a very welcome beef stew. With some of us looking to fish another rivers qualifier here in February next year, we could well be back at this venue before too long. 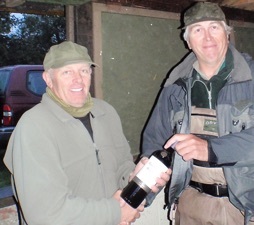 Michael Heritage won the morning session of the Peninsula Federation rivers qualifier on the Lower Itchen with 15 fish, putting him in 1st place overall, and earning him a place in next year’s Rivers National. Harry Fox and Andrew Green were about half way up but with the river not colouring up as much as expected after a week of rain, the fishing was surprisingly good. 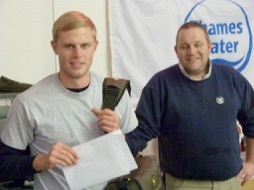 Tony Fox won the afternoon session of the South East FF Federation Rivers Qualifier on the Lower Itchen. Despite the river getting well hammered in the morning session, and colouring up slightly, Tony managed to extract ten grayling, well ahead of the rest of the field. 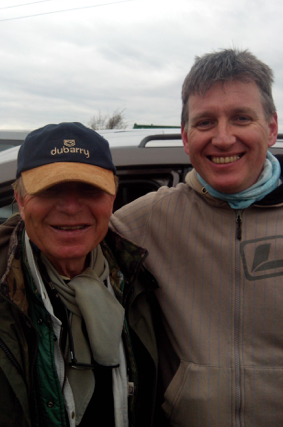 Harry Fox, Michael Heritage, Hector Rodriguez, Jim Dillon, Andrew Smith and Andrew Green also fished this match, and while we didn’t catch as many as Tony, we all had an enjoyable weekend. Competition News: Andrew Green finished 15th out of 97 in the Troutmasters Final at Grafham, getting one off the Dam in the morning and four drifitng into Pylon Point in the afternoon. In the Loch-style National, however, he was two or three fish short of qualifying. Mike Heritage ended up 1st reserve so has an outside chance of being in the England team for either Lough Owel or Brenig next year. 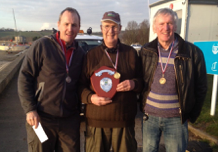 While Tony Fox was away with the team for the Autumn International at Menteith, Harry Fox, Frank Daley, Mike Heritage, Andrew Smith and Andrew Green all competed in the Grand Max at Bewl but found the reservoir in one of its tricky moods. Mike and Frank did well to take four and three fish respectively on dries. 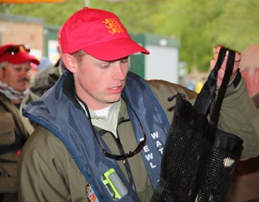 Top individual bag was John ‘Sooty’ Hancock with 7 fish, with the Belgian Flyfishing Forever the top team. 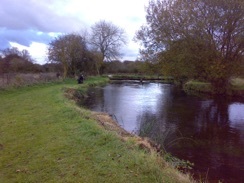 Farmoor Club Trip: Despite tricky conditions which did not lend themselves to prolific buzzer fishing, there was still good bags taken, with Gerry Hanley making the Thames Water weekly reports with 10 fish on a Brown Minky from Farmoor 1. 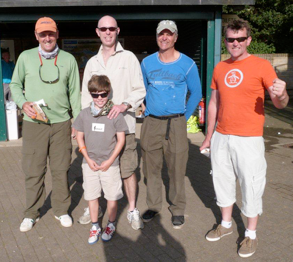 Frank Daley, John Ferguson and Kevin Blackwelll took the time to help out at Rutland Water Fly Fishers’ Youth Fly Fishing Day. 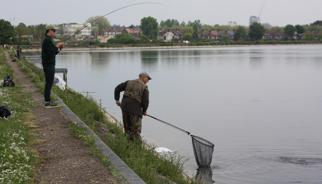 Despite more heatwave conditions they all helped their 10-17 year old pupils catch fish by various methods, including sinker and Boobies to floater and buzzers or corixae. 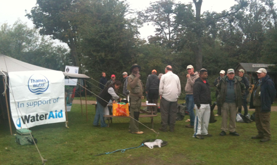 All of them thought that this was one of the best organised youth events they’d seen anywhere, with the youngsters first being introduced to fly casting and fly tying in the morning, before being given an afternoon’s tuition by experienced boat anglers. 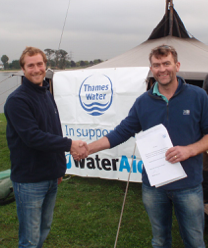 Rutland Water FF spend a whole year organising this event, and it pays off. 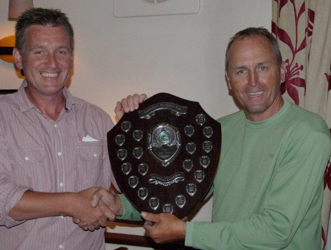 Tony Fox competed in the recent Rivers National on the River Dart, something of an arduous exercise given the hot conditions. Even so, a lot more fish were caught then had been expected. Tony was unlucky to get a few fish too small to count, finishing 22nd out of 32. 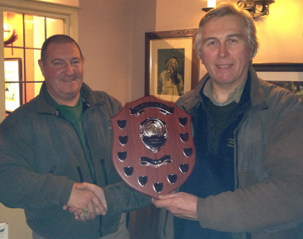 Terry Phillips from the Northern federation was the new National Rivers Champion, coming 1st in all of his four sessions. The East Warwick season has been extended by an extra month, in view of the unusually cold spring. Our thanks go to ranger Myland Monery for helping to facilitate this as a one-off arrangement. The latest club trip to Farmoor recently took place, and this time we were able to use a minibus supplied through a friend of Vince King’s. By all accounts they had a good time. 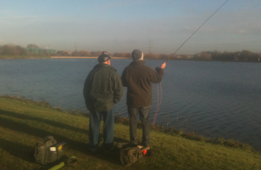 Andy Hathaway, Dave Jarvis and Gary Inwards were once again hard at work with the second Start Fly-Fishing session this year, which was another well attended event with 11 students. Billy Bridgeworth really got the hang of it, catching three trout. 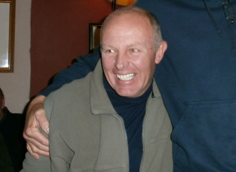 Although young and new to fly-fishing, Billy was already an experienced pike and perch fisherman, and he put his lure fishing skills to good effect to get the best out his Cat’s Whisker. 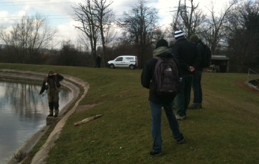 Vladamir Pelicic also managed to catch a fish on a buzzer, after losing a nice one early one. Mick Bibbsy was unlucky to lose one on buzzer as well. As usual, the intense fly-casting course in the morning gave way to fishing, followed by further casting and fishing instruction in the afternoon. 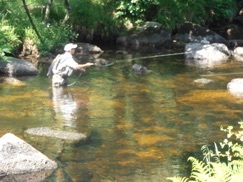 All the coaches agreed that the casting skills of some students really improved during the day. Harry Fox did very well to finish one of the top rods in the England team in the recent Spring Home International at Bewl. On a day which many found difficult, he put together a good bag of six fish on the floater and nymphs in one of the less pressured areas. Scotland finished clear winners more than 20 fish ahead of England with Wales third and Ireland fourth. A substantial number of dead fish appeared on No5 for a week or so, possibly down to deoxygenation from an algal bloom. At the moment No4 appears to be unaffected. 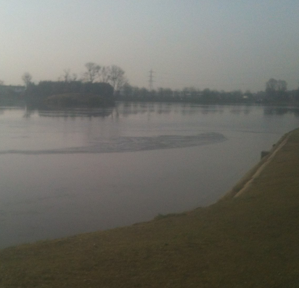 The club is pressing for a meeting with Thames Water as soon as possible to discuss why this happened. Meanwhile, Myland has given us this update on possible reasons and how this might be avoided in future. 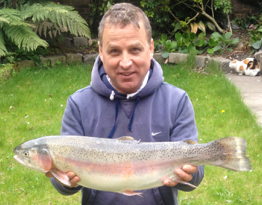 Marco Volino recently landed this cracking 8lb rainbow on an Orange Booby. He was fishing the Inlet on No4. Nice fish! 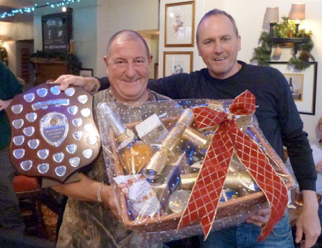 Frank Daley and Vinnie King fished the Iain Barr Airflo World Masters Bank Championships National at Elinor. Although they did not make the prize list, they got a chance to meet their hero, Bob Church, and an invite to the Bob Church Classic at Rutland. By the way, there’s another Greys heat at Bushyleaze on May 4th if you didn’t get through and fancy another crack at it. 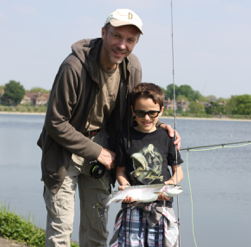 Tony Fox continued the Walthamstow FFC trend of cleaning up on other venues this season by winning the Bewl Bridge FF Bank competition with 6 fish for 12-10-0 from Goose Creek, ahead of son Harry with 5 for 10-8-0 from the same section. 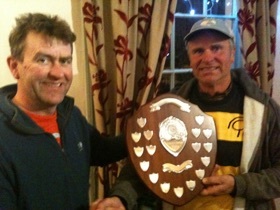 Frank Daley also won the Dunsters to Monty’s Seat section with 5 fish for 12-7-0. This is the second time Tony has won this event in the last three years. Not bad going! The Walk-round Consultation took place on a weekday, having been rescheduled from the previous weekend. We took this chance to put our views across, which were duly noted. 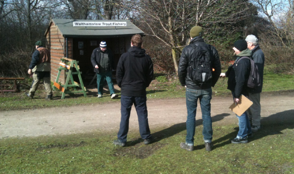 On the right you can see us discussing the possibility of an improved shelter, plus our chairman demonstrating the dangers from backcasting. The Fly-tying Evening was back in its traditional home in the Ferry Boat, but even so, we had a good turnout. Practical flies for this time of year, like Boobies and Buzzers, were tied, but we were amused to hear that one of the few fish that had been caught on that day had come out to an F-Fly when fish started moving. 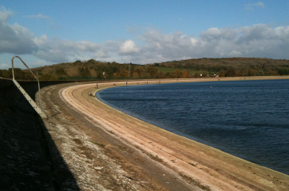 Although the reservoirs had been restocked that day, this was one of the grown-on fish apparently. 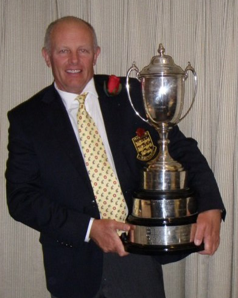 Vinnie King headed a Walthamstow clean sweep in the recent Iain Barr Airflo World Masters Bank Championships heat at Farmoor 1, and qualified for the Final at Elinor, along with John Ferguson who came second, ahead of Jim Dillon in third place. Here is Vinnie being congratulated by former World Champion Iain Barr. Good stuff! 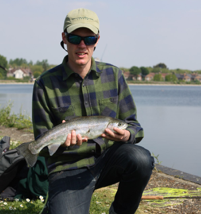 Notable fish caught recently included this ‘salmon-like’ 6-4-0 rainbow to Dave Jarvis from the day ticket reservoirs, and an estimated double figure fish caught (and returned) by Harry Fox from the East Warwick. 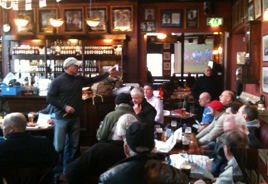 The AGM/Auction recently attracted a good turnout of a couple of dozen to the King William IV. Chairman Dave Jarvis gave a summary of the previous year’s activities, which included two well attended coach trips to Farmoor, and also informed members about a new charity match, for a local childrens’ hospice, as well as the Wateraid, the Troutmasters heat, TEFF Greys bank heat, and Wednesday Evening Series. The Auction saw 84 lots sold, fetching £548.40p, in addition to the £300 raised for Tom Sinclair’s goods. 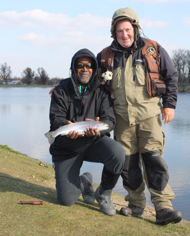 Frank Daley recently came second in a bank match at Farmoor reservoir for season ticket holders, which was also open to Walthamstow season ticket holders. Frank caught his eight fish in the first, winning a silver medal and a boat ticket for two days. Well done! The Final Fling took place in ideal conditions with a bright sky and light winds. Fish were on the move early, with four pounders landed by Ron Fry and Barry Shedden in the NW corner of No4 from 9.00am onwards. While DI7 and Boobies took a lot of fish, Tony Fox caught on floater and buzzers, Harry did well on the Minky, while Ray Taylor had fish on a bloodworm under a bung. In the end it was a very close result, with Andrew Green taking it with a 5lb rainbow, ahead of Barry Shedden’s 4-12-0 fish, Kevin Blackwell’s 4-7-0 and Harry Fox’s 4-4-0. 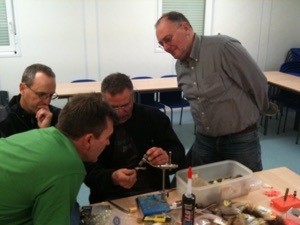 The latest Fly Tying Evening was held in the recently constructed Angling Academy, at the far end of the car park next to the Signing-In Room. About a dozen of us saw Ray Taylor tie a Coral Booby and a Buzzer, Roger Eglinton put together some river dries, and Kevin Blackwell take us through constructing an extremely realistic bonefish crab pattern.